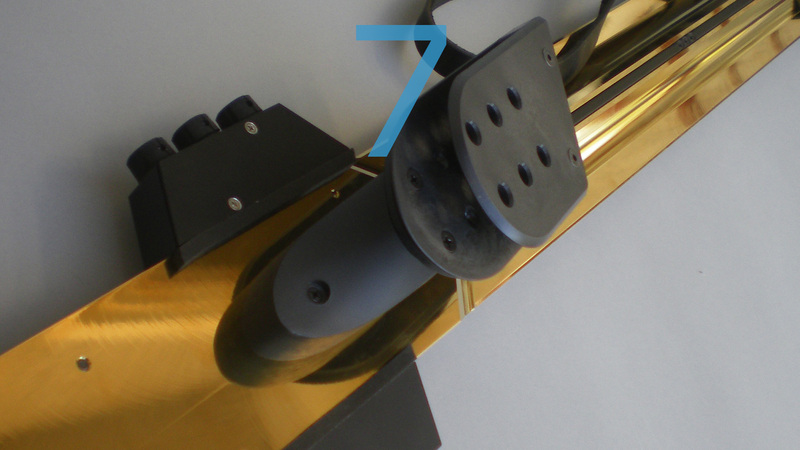 Assembly is fast, setup even faster, and on a scale of precision never before realized. The Railboard accommodates all 10-string custom tunings, including our recommended Stick 4ths/5ths tunings, also my recommended new "Raised Matched Reciprocal" tuning (both bass and melody sides up a whole step from Matched Reciprocal). 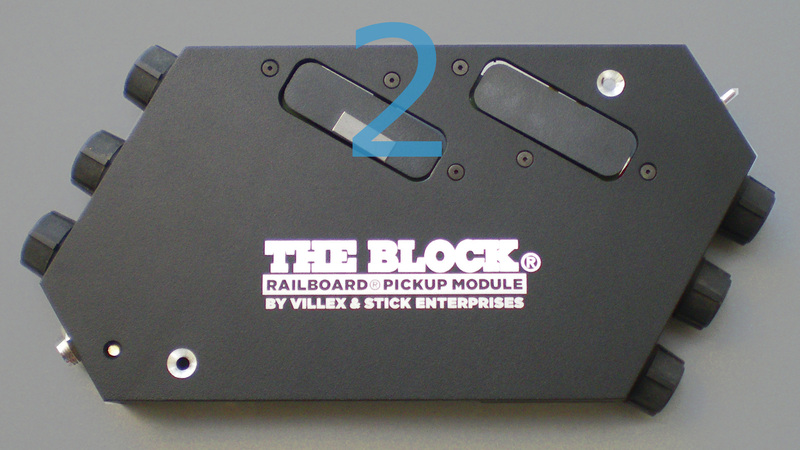 There are only ten parts to the Railboard (as shown above), each precision machined and molded to assemble into an easy-playing clear-sounding, sleek-looking new Stick model. (For more information about each item, just click on the photo). Total instrument length is 45 3/8 inches from bolt-on headstock tip to the rounded tail end of the aluminum neck beam where the ball ends of the strings are tucked in. Total length of our standard long-scale 12-string Grand Stick is 46 1/8 inches, 3/4 of an inch longer than this 10-string Railboard model. 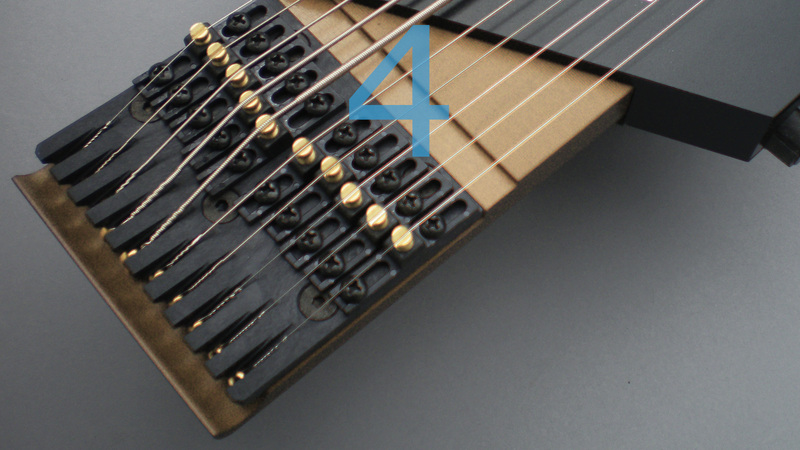 This new model's "scale length" (bridge to nut) is back to 34 inches, two inches shorter than the present 36 inches on standard hardwood, bamboo and graphite models, but the space from nut to "X-fret" is expanded by 1 3/4 inches to provide lots more room for the left-hand fingers and rear thumb at that first fret. 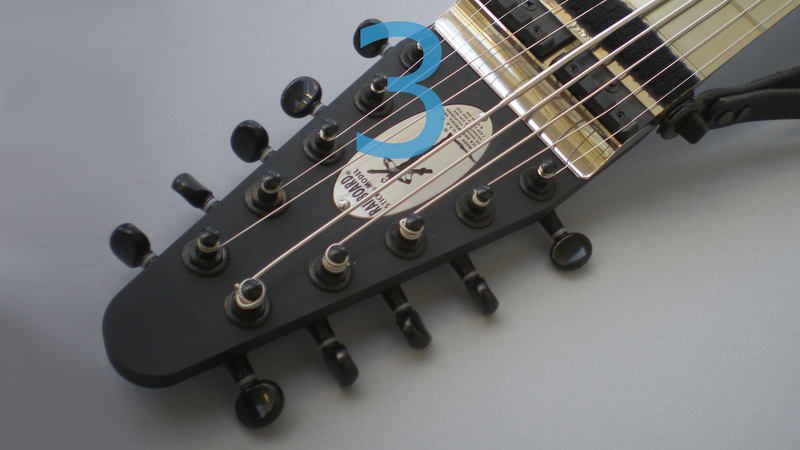 The X-fret space with damper is thus stretched to 3 3/4 inches from the standard 2 inches, providing a full and uniform tone and a consistent "feel" at this first tapped position. 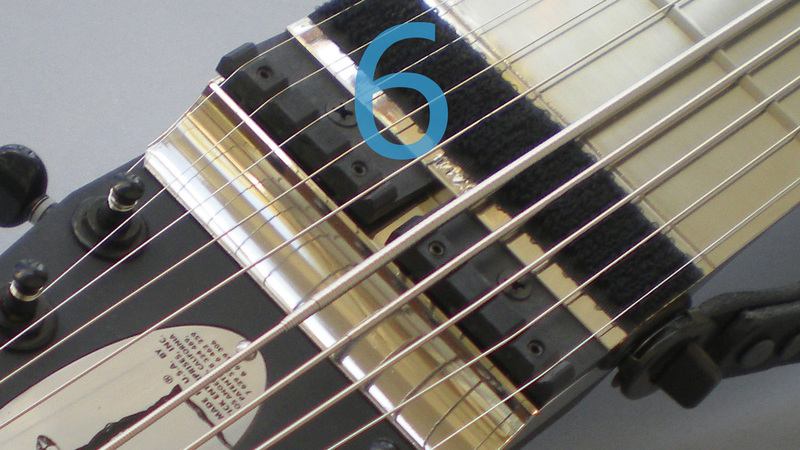 The first marker remains at the same distance from the Flaps (the nut) as on all current Stick models, that is, up two Rails in pitch from the X-Rail, (physically the third space on the fretboard). 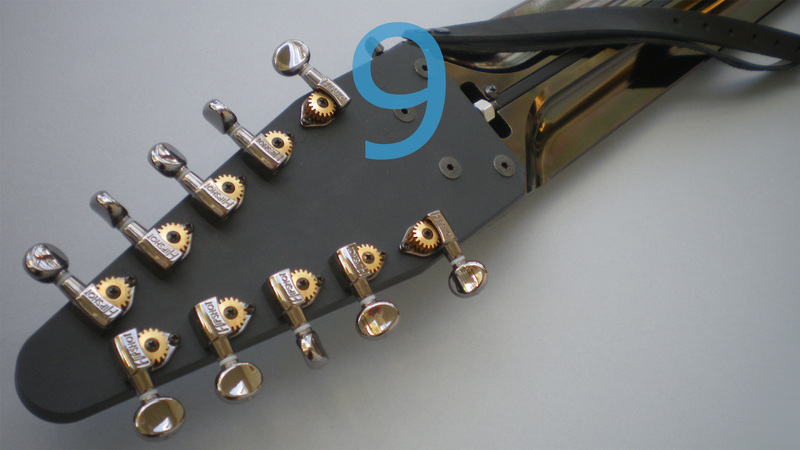 Thus for any tuning, all notes are at their same positions relative to the nut and fretboard "bowl" markers. All string gauges also remain the same. Only the "reach" of the finger span is very slightly reduced by the return to our old 34-inch scale length. 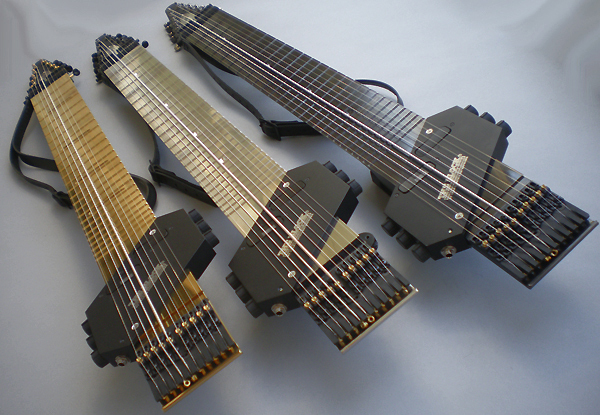 As on our long-scale Stick models, a span of 25 Rails provides a two-octave range for each string, from the first tapped note at the "X-fret" by the nut to Rail #24 nearest to the bridge. 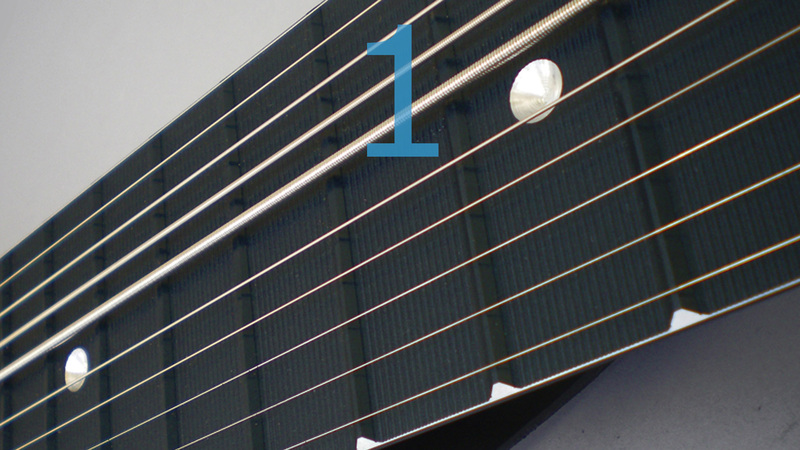 The first fret is not numbered (and is designated "X") because it substitutes for the nut where "open" strings vibrate freely to produce notes on guitar and other stringed instruments. 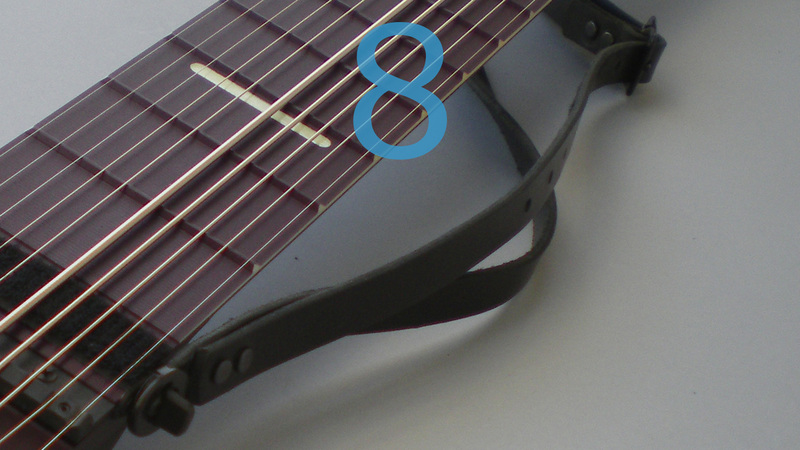 The Stick's damper prevents such open ringing, so the X-fret provides the first clear notes by tapping and all tunings are reckoned from there. With this new model, I also recommend a new tuning that I've been using on my bamboo Ten String Grand and now on my blue anodized Railboard. I call it Raised Matched Reciprocal and it's up a whole step from regular Matched Reciprocal to high melody D, and low bass D, with correspondingly thinner strings to match the higher pitch. This thin aluminum Railboard has an inherent brightness and this higher tuning seems to make it come alive. I like medium gauges best and the low bass D at the 6th position is very resonant at .106" (106 gauge). 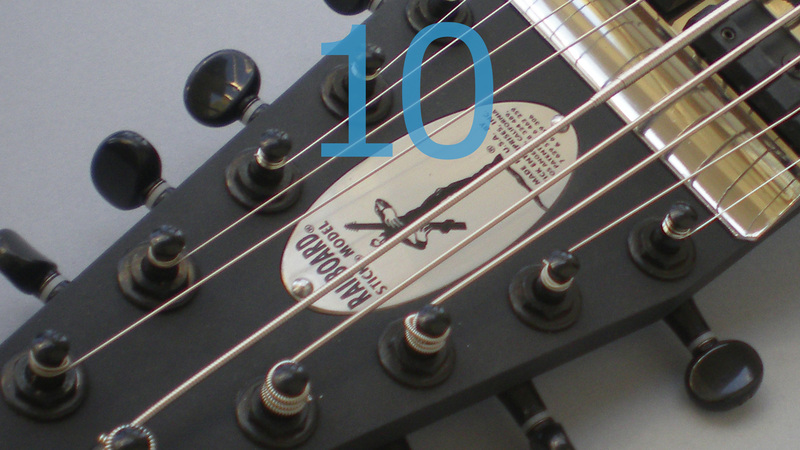 The high melody D is a 9 gauge string (back to Classic as seen from the melody side alone). Assembly: All parts bolt onto the main structure, the Railboard neck beam. 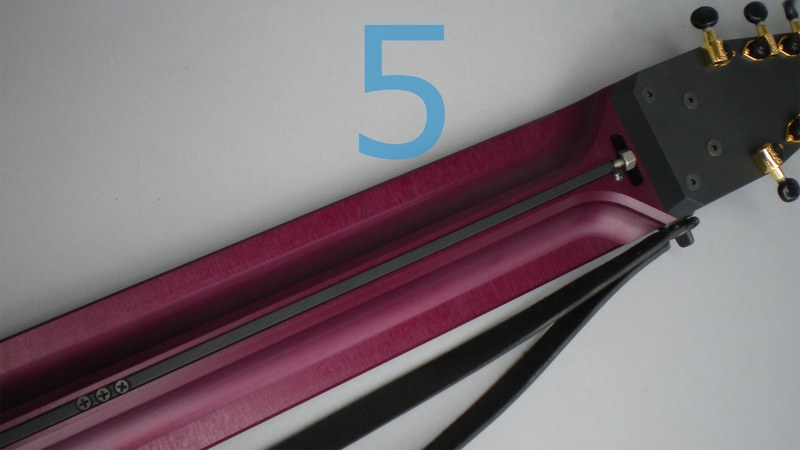 Dressing the Rails: The collective tips are machine trimmed to an even plane with some bass relief, then hard anodized. Setup: String heights are adjusted at the bridge saddles and Flaps (at the nut end). 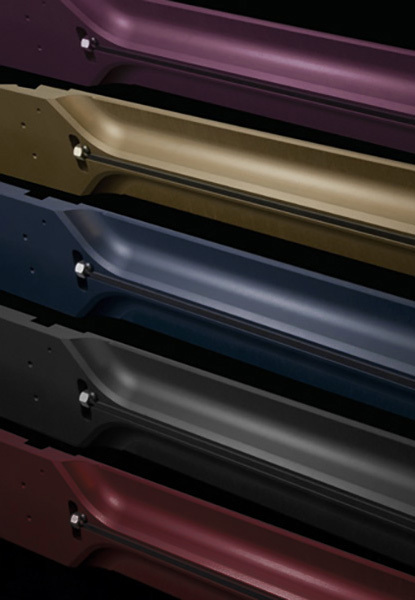 Pickup heights are set for balanced volume. Intonation for true octaves is adjusted at the bridge's SlideBlocks. Truss tension is independently adjusted at each end of the divided rod to precisely shape the plane of collective Rail tips. Setup work is minimized. Maintenance is simplified. Precision is raised to a new level. Costs are cut. Features include all improvements on my wish list. As for tone and touch, we'll soon have a demo video with some surprises. Read what our customers say about the Railboard.